One who revolts against the status quo attitude and is willing to actually do something about it. Attitude is power. Like electricity, it has two distinct states: positive and negative. Individuals with a predominantly negative attitude exhibit thinking that can be summed up in these two words: “I can’t”. Conversely, those with a predominantly positive attitude exhibit “I can” thinking. This is significant because attitude determines whether a person will put in the effort necessary to conquer obstacles and achieve goals. This makes attitude unequivocally tied to self-motivation and job performance. The time is upon us to fully comprehend the power of attitude – not only with respect to each of us as individuals – but with respect to the way the aggregate effect each employee’s attitude drives an entire organization in either a positive or negative way. Once fully grasped, it becomes immediately evident that nothing is more important than who gets hired. Nothing. The #1 greatest loss of human potential is “I can’t” thinking. The #1 greatest loss in organizational potential is hiring people with an “I can’t” attitude. 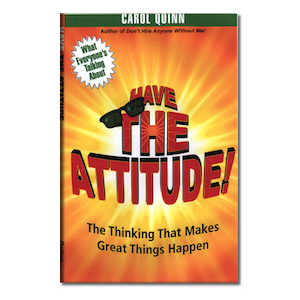 Carol Quinn, the creator of motivation-based interviewing – and author of a best-selling book by the same name – is an Attitude Revolutionist. First she awakens the audience to the power they possess within, with their own attitude, then works to disrupt and reshape corporate thinking about disengaged employees and the use of employee engagement tactics. The goal is to bring about a sustainable exponential improvements in organizational productivity and success. At age 8, my passion was already visible. It was my first time in what seemed like a huge shopping mall and I was so fascinated. While my girlfriends were looking at clothes, I sat in the center of the mall watching people walk by. I wanted to know what made everyone so different. This intrigue never went away. It only grew stronger. Looking back, it’s no surprise I chose a career in recruiting and human resources. After only one year working for an employment agency, I opened up my own. I was in my 20’s. After a few years I became hungry for more and went back to school. Did you know…an enormous amount of time and energy is wasted dealing with ineffective employees? Outrageous Potential Unleashed, Leadership Edition will help you become aware of the factors that prevent your company from achieving great success. Discover how missteps in hiring silently sabotage success. Learn how to spot ineffective employees within your organization. Unmask the real cause of underachievement. This book presents a framework based on a set of Best Practice action points that will help you harness untapped potential and transform your company into a MAXIMUM PERFORMANCE ORGANIZATION. 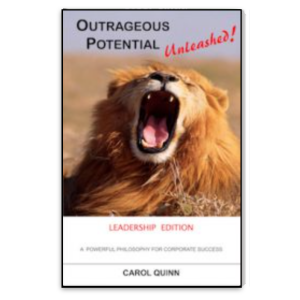 Outrageous Potential Unleashed is a must-read for managers and executives. 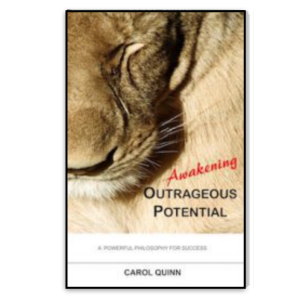 This book works hand-in-hand with the book Awakening Outrageous Potential. Awakening Outrageous Potential is for ALL employees. It offers a no-nonsense, authoritative blueprint for maximizing your potential. Don’t let its small size or simplicity deceive you. This straightforward, easy-to-understand book packs a powerful philosophy for success. It offers insight into the process of achievement and exposes the factors that limit your potential. In the short time you will spend reading this book, you will gain the practical wisdom you need to achieve things you never thought possible. Everyone should read this handbook for success! 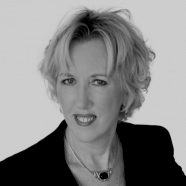 Your business has untapped potential lying dormant inside every employee. Have The Attitude! helps your employess draw upon this energy and realize their ability to attain the best possible results both professionally and personally. 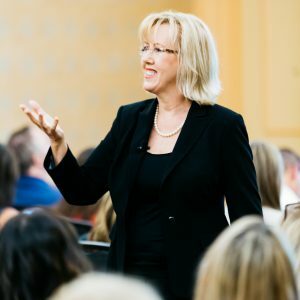 Hiring expert and popular keynote speaker Carol Quinn provides a complete guide for accurately and reliably assessing skill, attitude, and passion, so you can expose the incremental differences that separate the pretenders from the genuine high performers. Once you discover the power of Motivation-Based Interviewing you’ll never conduct an interview any other way! For HR Professionals: This is a SHRM-published book and can earn 3 SHRM Professional Development Credits for Recertification. My favorite class was one that focused heavily on understanding motivation. I got straight A’s in every class that had anything to do with the study of people. My favorite job was when I was hired by a large company to re-do their entire hiring process. I had free rein. Even though they paid me well, I probably would have done it for free. I was living my passion. By now I had taken all the classes, seminars and workshops I could on how to hire. I always sat in the front, paid close attention and took lots of notes. Applying what I learned didn’t seem to produce the good results the instructor touted however. Sure, I hired some good people but it was those not-so-good ones that continued to baffle me. Why was I getting great results one time but not the next? After all, I was doing the very best I could each and every time I interviewed someone. Call me a perfectionist but I wasn’t OK with being wrong about a candidate I hired. While most of the women at my apartment complex pool were reading Cosmopolitan, the magazine, I was reading Herbert Lefcourt’s out of print book titled Locus of Control that took me 6 weeks and $80 to get one copy printed. It was so worth it. With highlighter in hand, I was engrossed while I tanned. As I read, I realized the huge potential this powerful, insightful, researched information would have if applied to the interview process. Through simple, skill-related interview questions, the interviewer could gather candidate information that would distinguish those likely to produce great results from those less likely. As excited as I was, I knew I didn’t have all the pieces quite yet. Something was still missing. I wracked my brain for months and eventually put everything together. Next, I began shooting holes in it to see if it would withstand. It did well. As I used it, it worked better than any thing I had tried prior. When you understand what motivates a person and create an interview process that aligns with basic human nature, it does work. I spent a year tracking and validating my hiring results. Not being the direct supervisor of those I hired, I got valuable unbiased job performance information. I spent the next year struggling with one big problem that was still nagging me…it was too simple. No joke! I thought, for as long as interviewing has been around, if it was simple and effective someone else would have already thought of it. I believed an advancement in hiring had to be complex to be worthwhile. Then, I realized a complicated process doesn’t make anything better. Part of what made it so great wasn’t just its effectiveness but also it’s ease-of-use. Next, it needed a name. 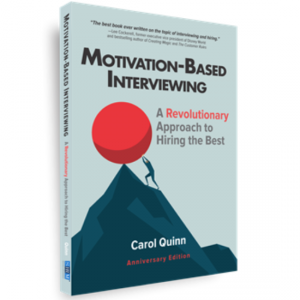 What truly fit it best was “Motivation-Based Interviewing” (or MBI for short) because it is so much more effective at accurately assessing an applicant’s level of motivation. I took a big risk quitting my job and starting Hire Authority but something inside told me it would be harder not to do it. Now, 13 years later in 2011, I’ve written a book on it (Don’t Hire Anyone Without Me! – softcover), it’s been translated into Spanish, there is a Train-The-Trainer program with more than 40 people trained, and it’s being taught in over 10 countries. The e-book, titled Motivation-Based Interviewing, can be read on your Kindle, iPad, iPhone, Nook or on your PC. My next book published was on the High Performer’s “attitude” and the role it plays in their success. It’s not about hiring (surprise!) but rather about bringing out the High Performer that’s in all of us. After that came the big 2-year project of creating an interactive, cutting edge, multi-media MBI web course. Now that it’s done, I have to say it’s an amazing course! It has two (2) different practice ‘virtual interviews’ where you have to write your interview questions, interview two job candidates, score them and then make your hiring decision. Both candidates have the skill to do the job…but one is NOT a High Performer. The course is all about teaching interviewers how to effectively hire the best. After the web course was finished, next came two more books. They are small, quick-reads that cost only $7 each. They contain a powerful philosophy for achieving greater success. One book (Awakening Outrageous Potential – 48 pages) is designed for every employee to read and the other book (Outrageous Potential Unleashed – 40 pages) is the ‘Leadership Edition’. They offer powerful pointers for creating a maximum performance organization. It’s been an out-of-this-world journey, and one that’s not over yet. 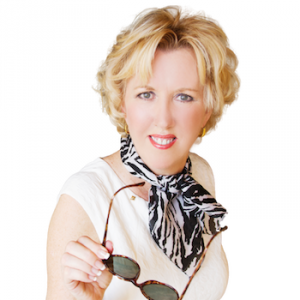 Understand…it’s not just an interviewing methodology that I believe in and am passionate about. It’s also a concept that I’m living proof of that it works and one that I want to share with the world!! !